Over the past few decades, the circular end-to-end stapler has gained wide acceptance amongst gastrointestinal surgeons particularly for its utility in the creation of highly reliable, low colorectal anastomoses. Intraoperative complications associated with the device are infrequent but mainly include bleeding, leaks, and difficult insertion or extraction with resultantbowel injury. Another technical dilemma mentioned only briefly in the literature involves failure of complete doughnut separation from the anastomotic ring once the staple line has been fired. In this scenario the anvilremains trapped intraluminally which has historically necessitated a colotomy for extractionor evenreconstruction of the entire anastomosis. We encountered this problem at our institution twice within a recent six week period, in patients undergoing low anterior resection for colorectal pathology. In both cases we were able to successfully extract the anvil without compromise to the anastomosis or bowel wall by excising the donuts through a flexible sigmoidoscope (see Figures 1-3). Both patients recovered well and remain free of complications to date. 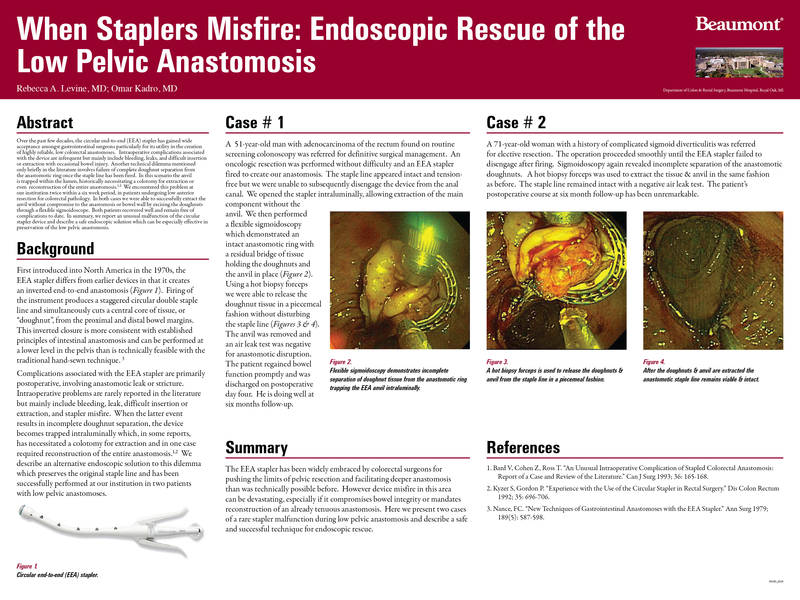 In summary, we report an unusual malfunction of the circular stapler device and describe a safe endoscopic solution which can be especially effective in preservation of the low pelvic anastomosis.